From a USA Today best-selling author! Good fences make good neighbors, especially if your neighbor is a goat. Eden Andrusek knows she should have fixed her fence last week. It's too bad her runaway goat makes a less-than-ideal first impression on her new neighbor, who turns out to be cute, brilliant, and a little uptight. Solar architect Jacob Riehl is furious when he returns outside to find a goat eating his presentation. As someone who likes everything in its place, he has little sympathy for a farm animal in the city or its tattooed owner, but there's something about the lovely Eden that captures his attention. What will it take to win over a man whose only pet was a goldfish? And how long can Jacob and Eden go without addressing the goat in the room? Would you listen to Secrets of Sunbeams again? Why? Yes! I love a good story, and there's something about listening to it that gives it an entirely different feel than reading the words themselves. I loved the exploration into the issues of pride and guilt. I really enjoyed how Comer used her characters to display some of the misconceptions, and misunderstandings that we often face when starting relationships. Which character – as performed by Jae Huff – was your favorite? My favorite character was definitely Eden. I loved how we got to journey with her through the painful process of letting go of the guilt that she held over her family's deaths. I loved that we learned about the process of compromise in a relationship as well. There definitely times when I didn't want to turn it off, but overall, it wasn't a cliff-hanger book in my opinion, but one that I enjoyed listening to for the time that I had it. I received this recording as a gift from the author. All of the above comments are my own opinions and thoughts. A wonderful story for an audio book! I enjoyed this book immensely. The relationships and characters were just the right level of complex and were certainly heart warming. I couldn't imagine how I would such a feisty goat! I loved the building of the romance, it's steady build was perfect for the story setting and I loved the family/friend connections. A perfect listen for when you are traveling long or short distances or needing some chuckles while cooking! What did you love best about Secrets of Sunbeams? I was so sad when I heard that Valerie Comer was wrapping up her Farm Fresh Romance series so it was a great relief to hear that she had an urban spin-off series in the works! And this first installment, Secrets of Sunbeams, did not disappoint! Comer managed just the right balance of creating a new community for this series while giving her fans a few peeks into the lives of the characters we've come to love from the old one. I enjoyed getting to know Jacob, the compulsively tidy little brother of two of the characters from the Farm Fresh series, and Eden, his next-door neighbor with her own little backyard farm in the city. The two of them have lots of hurdles to overcome in their relationship as they have very different ideas of how they want to live. My favorite part of the story was Jacob's character arc - I love how he grew and learned to really seek the best for the ones he loved. Comer beautifully struck another delicate balance in him of confidence and humility in his spiritual walk. I was a little disappointed that Eden's character didn't grow more in this book. I don't want to give anything away, but I will say that I found myself thinking several times towards the end of the book that I hope nothing unexpected ever happens to this couple because she had shown absolutely no willingness to bend on the way she had planned out her life other than letting Jacob fit himself into her plans. Then it occurred to me that maybe she will grow a little in side stories of the ensuing books of the series which could be cool and actually better than cramming all her growth into this one book. 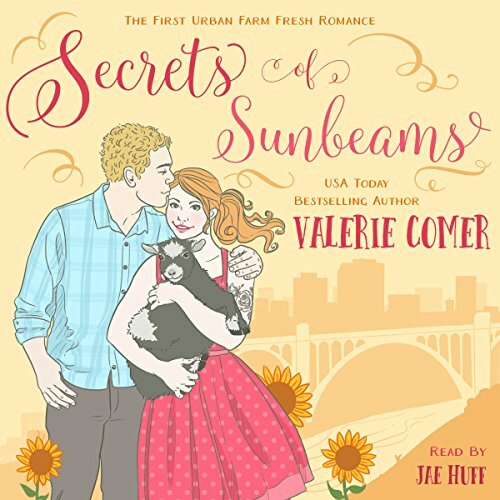 Very animated audio of this first URBAN Farm Fresh Romance by Christian author Valerie Comer. Narrator Jae Huff did a great first job on this clean, inspirational story. You'll enjoy her performance as much as the excellent audio books in the FARM Fresh Romance series (which you might also want get, if you haven't already!) that was performed by another truly awesome narrator. Secrets of Sunbeams is simply a wonderfully hilarious kick-off for this new series. Book 1 presents a (first) love story for Jacob Riehl, who we had met in the FARM Fresh Romance series, and sweet Eden Andrusek, a gentle young woman who really likes her pet, Pansy. You'll meet an interesting mix of (new) characters in this urban series, including some new great/funny/feisty kids that'll make you chuckle. If you've read the first farming series, this book will provide you with a glimpse at the beloved Green Acres crew and, of course, it's always nice to catch-up and find out what's happened at the farm (since Berry on Top).